Discussion in 'Knife Reviews & Testing' started by JNieporte, Jun 9, 2008. Handle Details: The Executive is 74mm (3") long. It's about .4" thick, and is pretty lightweight for the features it packs. My knife, model 53401, has red celluloid handles, but you can get a black-handled model, number 53403. The left side of the knife (the side with the Victorinox shield) has the standard tweezers, while the other has the standard toothpick. You can switch these if you want because the tweezers and toothpick have a flat top instead of an angled top. You also get the standard .5" keyring. Now, a 3" closed knife may not seem like much, but it really is nice to have so many effective tools in such a compact package. Notice I said "effective". There's no wasted space with this model. Large Blade: The Executive has a 2.25" blade with a 2" cutting edge. 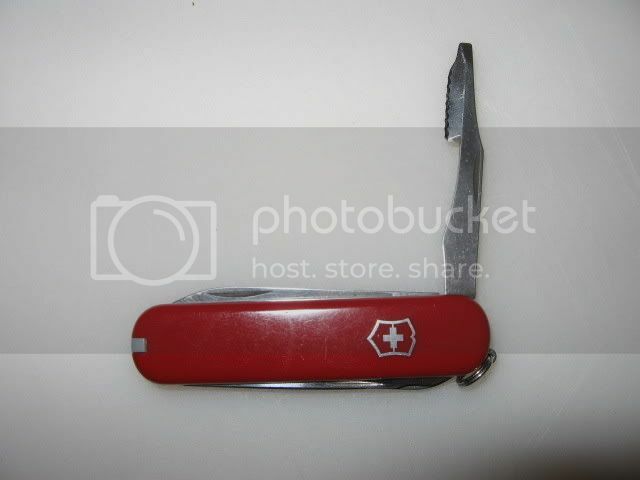 The left side has the standard Victorinox stampings - VICTORINOX over SWITZERLAND over STAINLESS over ROSTFREI. While not a large blade, it still cuts like a larger one. It takes a very nice edge and holds it quite nicely. The size is just about perfect for a pen blade (just .312" wide). 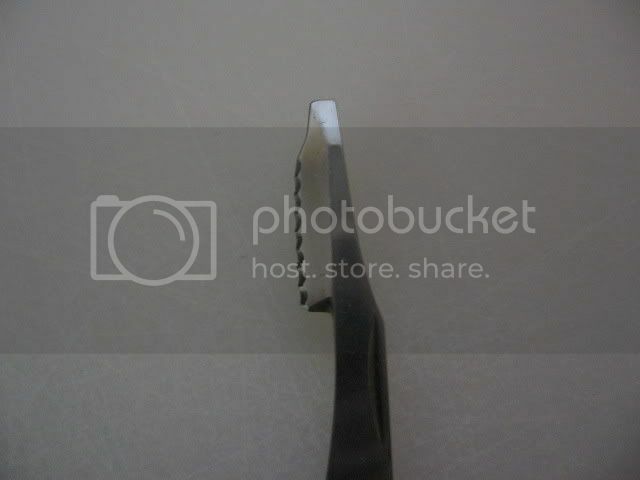 Small Blade: The smaller blade is 1.4" long with a 1.25" cutting edge. It's .25" wide, and is really handy if you keep it razor sharp. It does a good job of getting out splinters that would be too small and delicate for the larger blade. Again, it's easy to get extremely sharp. Scissors: The fold-out scissors on the Executive are 2.12" long when open, and the cutting edges are .5" long. Mine are held together by a screw, but the newer models are held together via rivet. They cut as well as any other scissor I've seen, so it's not really worth commenting on here. I do like that the scissors unscrew to make sharpening a bit easier. Nail File: Yes! A nail file that is actually worth something! It's 2.18" long when open, and the file is 1.68" X .25" in area. It doesn't have the "raised bumps" surface that other nail files have, but actual file teeth. This helps tremendously with filing, whether it's fingernails or wood. Strike-anywhere matches are easier to light on this thing, too. The tip is slightly pointed, but not enough that you'll injure yourself while cleaning your nails. It's also good for driving smaller Phillips-head screws. The back side of the file is blank. Orange Peeler: A tool unique to the Executive, the orange peeler / scraper is 2.12" long. 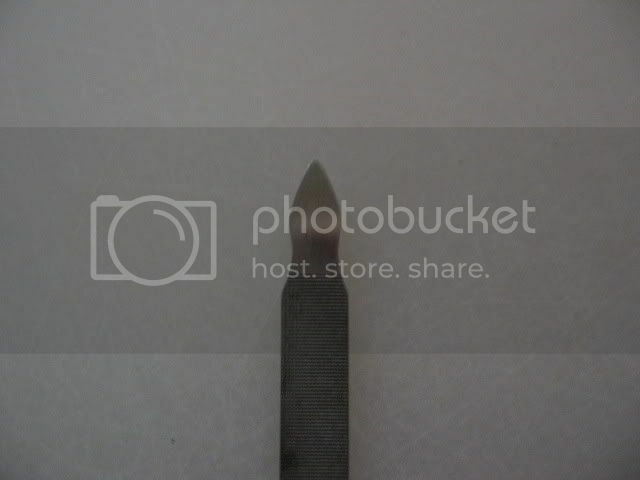 The tip is flat and thick enough to be used as a small flathead screwdriver. The inner edge is flat and sharp. It's used to peel the orange (or tangerine, or whatever you have). You insert it and draw it down the orange to score the skin. The serrated scraper is then used to scrape away the skin and pith. It also makes short work of masking tape and smaller, fibrous materials. The Executive carries with it a nice array of tools, and I know of more than one person who buys the Executive just for the orange peeler. It's 3" closed and fits on just about any keychain. See for yourself how well this assortment works, and then tell me this isn't worth the money. See? You can't. All of these photos are from SOSAKOnline. The Executive, with the orange peeler open. Close-up of the orange peeler. 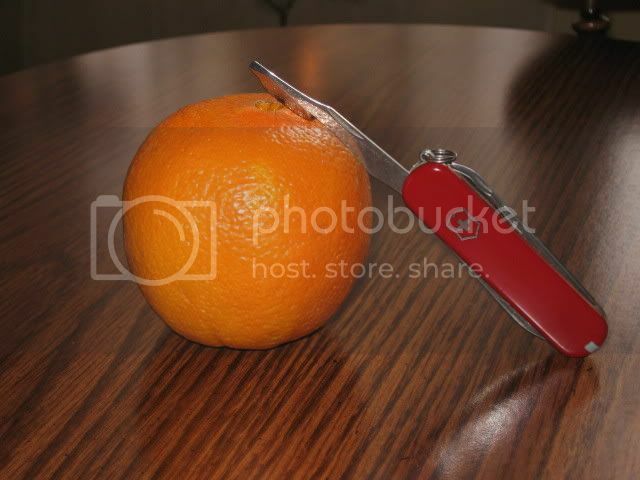 The orange peeler in use. The nail file / cleaner. The nail file's cleaning tip. The Executive is my favorite EDC SAK. I have three of them, but the one I carry is the black-handled version. It really is a great knife, and I actually use every feature to greater or lesser degrees. I find it strikes a great compromise between being small/compact, yet being substantial and having most of the features I need in a small EDC slipjoint. No matter what other knife(s) I have on me, I always have my Executive in my pocket, and use it every day. I like it to. I carry it very often. My executive has red metal handles and no twezers and thothpick. 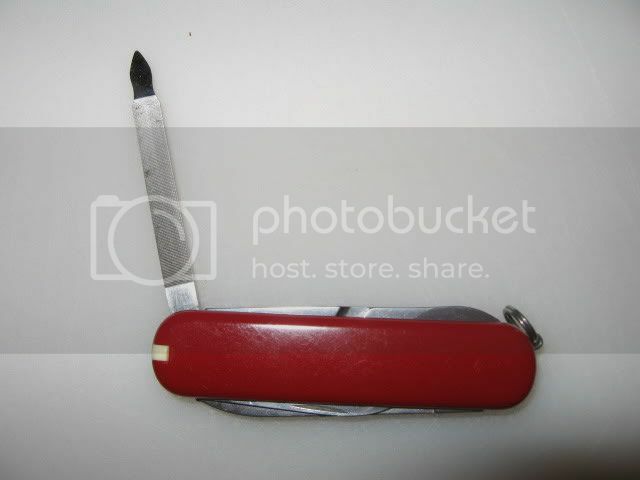 I cut of the top of the file to make a broad screwdriver and remade the orangepeeler to a narrow screwdriver for glases and small elektrical screws. I think that the knifeblade is good for peeling fruit and the small knifeblade (any knifeblade actually) is perfekt for kleening my nails. Mine to. This is my EDC knife.,,,VWB. Oops, old thread, but I think SAKS ars great and this little one is amazing! Thank you.